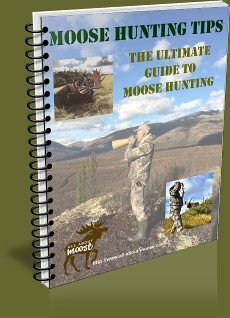 As a moose hunter I've always thought having an outfitters tent would be an ideal way to camp and experience the wilds of British Columbia. 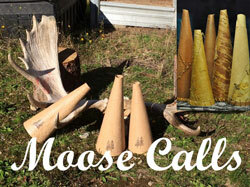 I've seen many moose camps with a tent set up and a woodstove pipe billowing smoke out of it. Oh that would be soooo comfortable! Somehow sleeping outdoors in a canvas tent makes the experience that much more authentic. After doing some research and asking a few friends about styles, fabrics and sizes we contacted Perry at Deluxe Wall Tents. Our experience during our purchase of a tent was awesome! Right from our first question, all of the answers came quickly and fully. Perry guided us though the steps and recommended a tent size to suit our needs. We actually made a trip over to Vancouver Island, while we were there we met Perry, got a tour of his manufacturing facility and picked up our tent... the whole experience was seamless. The front door of the wall tent. Both the main door and screen are rolled up and secured out of the way. We ordered a 14X16 deluxe tent with 5 foot walls. 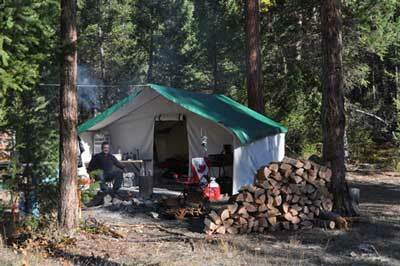 The deluxe canvas wall tent comes with an aluminum frame (4 truss to ensure snow load strength). 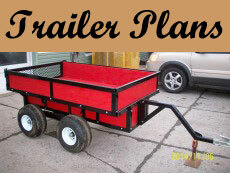 The aluminum frame is made from aircraft grade 6061 pipe. The fittings are all cast aluminum with machined spigots to fit the pipe. Also included is a porch area or open vestibule. This is an awesome place to set up your kitchen and to have a place to sit out any inclement weather. The tent includes a stove pipe jack in the wall (your choice to placement) so you don't have any leaks from the roof. The main door is a two zippered opening with mosquito mesh that can be zipped from inside or out as well as rolled up and stored when not in use. 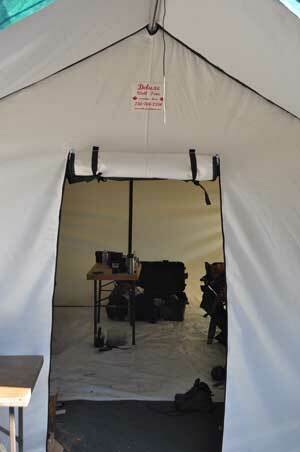 There is a rear zippered door that is centered in the rear wall for joining more than one tent, for instance if you had two tents: one for sleeping and one for cooking. The tent also included a floor tarp (HD plastic) and a heavy duty tarp to cover the roof to ensure your tent stays dry. The tent also came with a drying pipe to hang clothes to dry over the woodstove. Its 1" diameter by 62 inches long with a cord through the center to hang with velcro from the trusses. We made two additional ones for hanging wet gear. The first time we set up the tent we found the the tent a snug fit to the frame, we actually struggled with it a bit to get the tent square so we could close the zipper on the door. Now that we've set the tent up about half dozen times we have a bit of a system figured out to make sure the zippers will close. We actually had to modify the frame. The inside of our tent. This trip was with two guys. As per the Deluxe Wall Tent website and gathering info from others, what we found is the canvas shrinks just a little if it get wet (or damp). We took the frame and separated it into its categories: legs, trusses and horizontal pipes. Next we shortened each of the truss assemblies by 3/4 of an inch. Then we shortened three of the horizontal pipes by 1 1/2 inches. These three pipe we identified with white tape. When we assemble the frame we just make sure that one of each of the pipes with white tape goes into the same truss setup. That is: one on each wall and one on the ridge-line (all in the same group). The legs were next shortened by 3/4 of an inch each. Now when we assemble the tent on uneven ground (its always uneven in the bush) we can fit the canvas very easily and don't struggle near as much trying to get the doors zippers so they close without a fight. Another thing we did was to make an extension for the porch. We bought some extra fittings from Deluxe Wall Tents and went to the local metal store and bought some pipe. Our extension adds another six feet to the kitchen area and when its completely tarped in (we just used some nylon tarps) the area is easily heated by the woodstove in the tent and creates a very cozy area during bad weather. Watch our walk though video on YouTube to see what I mean. 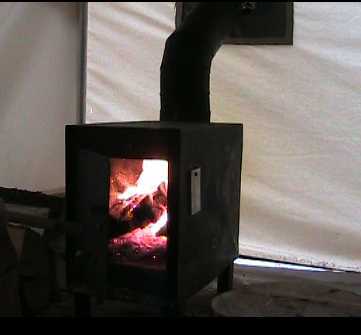 You can't camp in a wall tent without a woodstove... can you? Well, we don't think so. We setup a nice little woodstove to keep us warm and dry out the gear that got wet. Boy, did we get wet this year too. 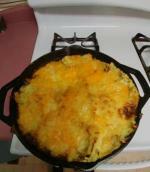 We were so grateful to have the stove to dry everything out. It's really nice to put on warm socks on a chilly morning. Just hang them over the wood stove the night before. This tent is unbelievable in comfort and style. 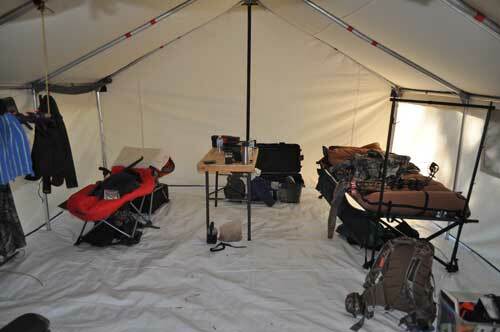 Our hunting party was more than accommodated and comfortable in this wall tent. A 14X16 tent is really too big for 2 guys, just right for 4 guys and will be a bit crowded with 6. 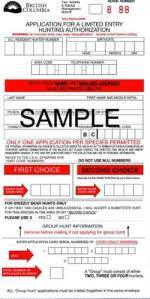 You'll have to figure out how much space you need for your group of moose hunters and all their gear.